Early Riser is a constrained experience compared to Fforde's more expansive series, but still sparkles with trademark wit and weirdness. I am contractually obliged to begin all reviews of Jasper Fforde by thanking my mother, who got me in to his writing (and out of a period of teenage pretentiousness in which I thought I only wanted to read "the classics") by sending The Eyre Affair to the Eurasian continental pole of inaccessibility, where I was living at the time. The Thursday Next series, with its blend of whimsical worldbuilding and little England nostalgia, turned out to be a much better prospect than endless rereads of War and Peace, and a combination of further shipments and lucky bookswap finds meant I got to enjoy the entire series (regrettable incident with a US edition of Something Rotten aside*) at exactly the point where I was most susceptible to its charms. It's with that love for his work that I approach this new volume -- Fforde's first new book in four years -- so to say my expectations were high is something of an understatement. Fforde's novels are all set in alternate visions of England or Wales, in which a recognisable set of British cultural elements have been broken down, stirred around, reconstituted with a completely different logical framework and a more or less authoritarian atmosphere, and embedded into the overarching "what-if" propelling that particular story. In Early Riser, the skew comes from the fact that humans in this version of Earth, where climate apparently works completely differently, have evolved to hibernate through winter. This single biological change precipitates a massive shift in how human society has developed, with a significantly altered pattern of mortality and technology; yet somehow the path of development has still thrown up such recognisable fundamentals as Mini Rolls, Rick Astley, the class system, and the Welsh seaside village of Mumbles. A few crumbs of worldbuilding hint at how the world outside Wales copes with hibernation, what with weather and seasons still not being the same everywhere, but this isn't very fleshed out: Early Riser isn't a watertight worldbuilding experience, but it's a very fun one. It's important to note that writing nostalgically about 20th century British culture in 2018 is a significantly more politicised exercise than it used to be, and there's definitely an "edge" to the world of Early Riser that's more reminiscent of Shades of Grey, Fforde's foray into outright totalitarian dystopia, than Thursday Next's weird Swindon (jingoism around over a hundred years of the Crimean War aside). Hibernation means more than just cosy references to comfort food and trashy TV: there's also highly centralised governance and increased corporate power as everyone relies on giant dormitories and dubious technological innovations to survive the winter at the cost of human dreams. Throw in the state campaigns to encourage women to reproduce as much as possible, and unfair stigma directed at the "undeserving awake", people who for medical or personal reasons can't simply fall asleep all winter and therefore require more food and care within the dormitories, and you've got a world that can't possibly be mistaken for rose-tinted nostalgia. Like Shades of Grey's Eddie Russett, our protagonist Charlie Worthing starts out as an unthinking supporter of the system, but ends up caught up in events that force him to think more critically about his place in society. Early Riser's political stance is gently scathing, but it's scathing nonetheless, and the way the plot integrates the act of dreaming -- pointless timewasting, to Charlie -- is particularly hard not to read into. The plot takes place over winter, as Charlie signs up to become a Winter Consul in order to secure his rights to a scarce drug that helps most who take it to survive the winter, but prevents people from dreaming and causes one in two thousand people to awake as a "nightwalker" (i.e. zombie). Charlie fails to question the cursory interview he undergoes to sign up for this incredibly dangerous job, and it's not until he finds himself stranded and overwintering in the dangerous Sector Twelve that the ramifications of his decision sink in. The mysterious happenings in Sector Twelve include a weird collective dream, a senior Consul and a Sector Chief who don't seem to realise they share the same body, and a wintry phantom which murders the unworthy to a Rogers and Hammerstein soundtrack. Charlie is a fairly reactive protagonist through most of this, and doesn't really have much agenda beyond survival, but the plot progresses at a decent pace anyway and the supporting cast are generally an enjoyable bunch. The unique Ffordian worldbuilding elements do not disappoint, and there are a few particularly fine moments where completely left-field elements of society or hibernation-human biology are casually mentioned in a way which makes it clear that they haven't come up before because Charlie doesn't think they're at all notable. It's a very satisfying way of constantly reminding us that we are dealing with a very different human culture, and it helps balance the obvious but plot-irrelevant holes in the wider worldbuilding. That said, while Early Riser is another magnificent entry in Fforde's bibliography, it didn't wow me to the same extent as The Eyre Affair or Shades of Grey did; I'm quite happy that it's intended to be a standalone, and don't feel a great need to explore any more of this particular world beyond what this volume offers. Everything just feels more constrained than Fforde's other work, and while part of this is just the claustrophobic hibernal setting, I suspect it's also just built on a smaller scale. The weird details and tangents are just interesting enough to carry the story they are in, without leaving much additional food for thought. It's highly obnoxious to judge a work based on the timelines of the author's unfinished series, but I suspect for a lot of long-time fans, Early Riser might be a mixed experience: great fun, a promising sign of more to come, and yet not quite what we were waiting for. That said, being a standalone at least means it doesn't end with more tension, wrapping up Charlie's story and its world-changing implications in a swift but ultimately satisfying conclusion. US readers might have to wait until 2019 for this one, no doubt due to the extensive localisation team required to research the cultural equivalents of Jaffa Cakes and Ambrosia Rice Pudding. 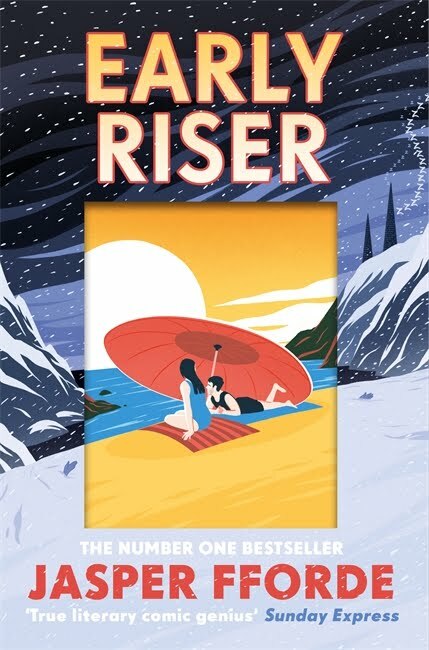 However, for those with access to it, Early Riser is a recommended read for Fforde fans, and also provides an excellent introduction to his work for those who might prefer to start with a completed story instead of an ongoing series. You can thank my Mum for the recommendation, if you like. *To get real for a second, English toddlers don't pick "boogers" out of their noses. They pick "bogeys". I don't make the rules. Bonuses: +1 Features a sisterhood of professional mothers with names like "Fallopia" and "Zygotia"; +1 Literally made me go out and buy Jaffa Cakes. Penalties: -1 It's good Fforde, but it's not peak Fforde, you know? Nerd Coefficient: 8/10, "Well worth your time and attention"